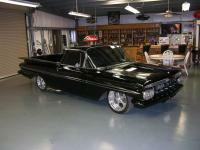 1959 CHEVROLET EL CAMINO - "Stir Crazy"
That is one bad @ss chevy el camino! You have got to tell us on a thread what its like owning that thing! All times are GMT -7. The time now is 01:02 PM.